You’re an important part of a student’s life. The Leukemia & Lymphoma Society’s Student Series is a series of service learning, character education and philanthropy programs where students gain the unique experience of helping thousands of people in their fight against blood cancers. LEARN MORE about this unique website here. Roll out—or roll up—the red carpet. 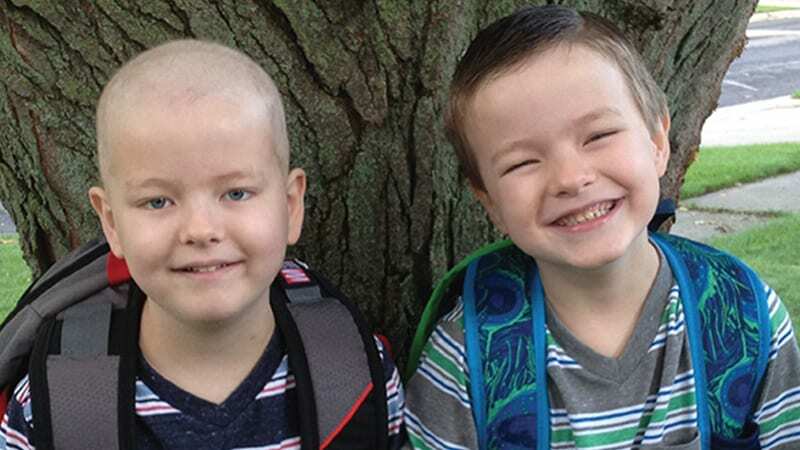 It’s not uncommon for children with cancer to miss significant amounts of school while undergoing treatment. 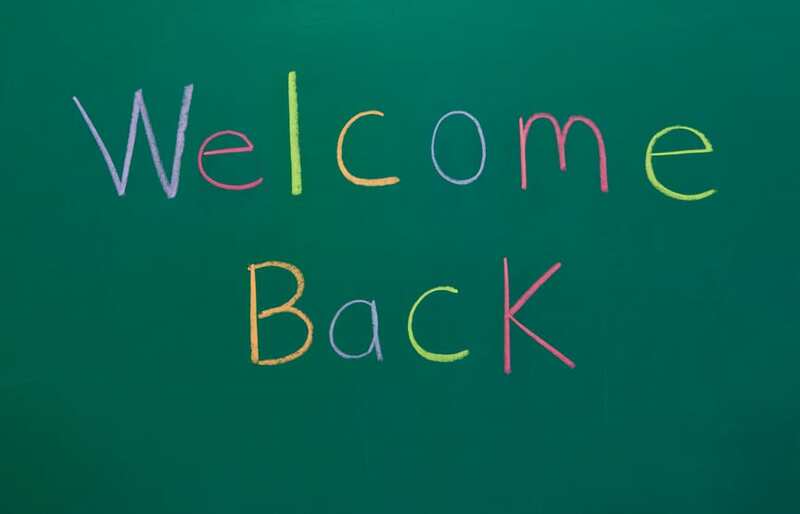 Returning to school can be unsettling for the child, who may worry about fitting back into the classroom environment. Set the stage for success by planning a welcome that’s as lavish or low-key as the student would like. Some students would love a big welcome, complete with a red carpet, posters and signs. Other students want to ease back into class with as little drama or fanfare as possible. Not sure which is the correct approach for your student? Talk to his or her close friends, parents and siblings; they can clue you in to the student’s current emotional state and preferences. Cancer treatment—particularly chemotherapy—can cause cognitive changes and learning difficulties such as trouble paying attention, verbal and visual memory impairment, and delayed processing time. Further, the disease and treatment can impact a child’s physical stamina, mobility and dexterity. Have a frank conversation with the child and family about his or her capabilities and challenges; a member of the medical team may also be available to help you understand the child’s needs. Tailor your help to the child. Your student may need extra time to complete assignments, one-on-one or peer tutoring, or alternate methods to demonstrate knowledge, such as a verbal discussion in lieu of a written test. Many students with cancer qualify for 504 plans (critical-illness plans), so pull in other staff members as needed. Include the student in ALL class activities. Your student may be in and out of the classroom due to doctor’s appointments and sick days, but he or she should always feel like part of the class. Monkey in My Chair is a program that helps kids with cancer stay connected. The program provides children with a big stuffed monkey that takes their place in school when they can’t be there. The monkey can be included in class activities—recess, lunch, reading circles—and can go along on field trips. The program also includes online access to Monkey Message, a way for your students to share monkey photos, updates and notes. Learn more about the program here. You can also use social media (Twitter, Facebook, Class DoJo, etc.) to share classroom activities. If your student is up to it, you can even livestream classes. Thanks to technology, your student may be able to collaborate with classmates on group projects via programs such as Google Docs and Google Slides, even if he or she can’t make it to school. “One of the greatest fears for the family after diagnosis is that the child will be forgotten by their peers,” Buff says. Set aside time for your class to write notes and cards. Consider collecting (and delivering) a basket of goodies the next time the child is in the hospital. (Talk to the family first to see if there are any restrictions.) Have your class record a video greeting; upload or email it. Jacob Steger, a seventh grade teacher at Mayville Middle School and varsity basketball coach at Mayville High School in Wisconsin, helped some of his students plan a “Gold Out Game” to raise awareness of childhood cancer and show support for a classmate with brain cancer. Steger invited any interested students to work with him on the event, a varsity basketball game that featured players and fans in yellow T-shirts to show solidarity. The event, Steger says, gave students a concrete way to express their friendship and showed the student with cancer how much her classmates cared about her. Fundraising activities such as the Leukemia & Lymphoma Society’s Pennies for Patients, a three-week program for elementary and middle schools in which students collect change and raise funds online while learning about service and philanthropy, can also be a great way for friends to work together and show support. 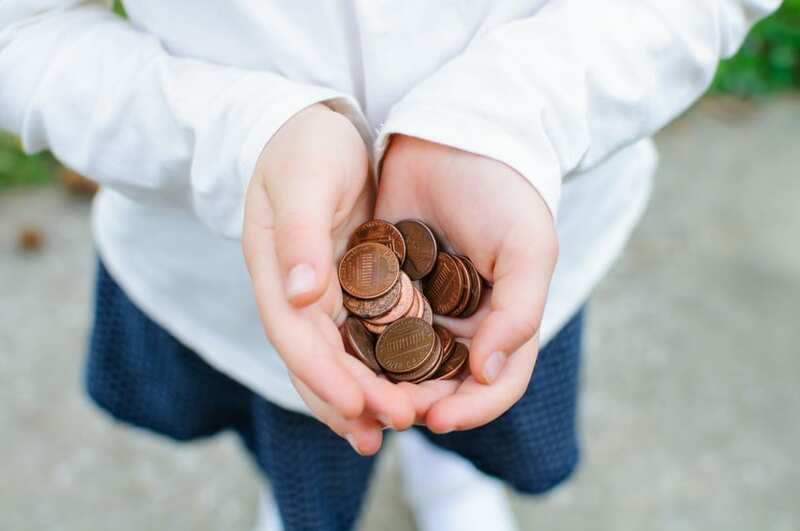 Learn more about having a fundraiser in your school right here. Talk to the child about everyday things. In addition, just talk to them about their everyday life. Most kids say they just want to be treated normally, so help do this. Do they love sports? Talk to them about their favorite team. Do they like music? Compare your favorite tunes. Have conversations about all the regular stuff that you’d talk to your other students about. Get more great resources for teachers. 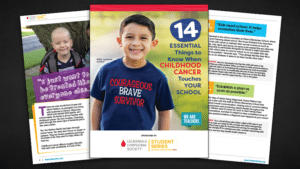 Download our FREE GUIDE, 14 Essential Things To Know When Childhood Cancer Touches Your School.